Philip Cohen posted some interesting data at his blog, Family Inequality, that I think will look at first blush, counterintuitive to many. The figure below shows the percent of men’s income that women bring home, organized by age bracket and level of education. The top bar, for example, tell us that, among 45-50 year olds with advanced degrees, women make 68% of what men do. First, notice that women with more education (the lighter bars in each age bracket) do worse compared to men than women with less education. That is, the gender inequity is worse in the upper classes than it is in the lower classes. Why? Well, people tend to marry other with similar class and education backgrounds. Accordingly, women with more education may be married to men with higher earning potential than women with less education. Those women are more able to make work-related choices that don’t foreground economics, since their income is less central to the financial health of the couple. They are also more likely to take substantial amounts of time out of the workforce when they have kids (working class women can’t afford to do so as easily), and we know that doing so makes a real dent in career advancement. So, perhaps ironically, women who are “richer” educationally may marry economically richer men who then allow them to deprioritize their careers. Second, notice that the most equal incomes (where women make 85% of men’s salaries) occurs among the youngest and least educated group: 25-34 year old high school drop outs. Why would younger women do better relative to men than older women? Some of this may be due to a decrease in gender-based discrimination. But it also likely has something to do with the devaluation and disappearance of traditionally working-class men’s work. Most of the narrowing of the gender wage gap, in fact, has to do with the lowering of men’s earning power to meet women’s, not vice versa. As the industrial base in the U.S. has been collapsing, the number of historically-male blue collar jobs have been shrinking. Meanwhile, our industrial economy has been replaced by one split between (well compensated) information/technology and (poorly compensated) service jobs. Those service jobs are going disproportionately to women. So, while men still dominate (especially the most well-regarded and well-compensated) upper class professions, their dominance in the lower rungs of the economic ladder is waning. Thanks again to Philip Cohen for the data! I think that the relative parity at the bottom is due to minimum-wage laws, which establish the same floor for both men and women, not to differences in attitude in different social classes. Why do we always assume that upper-class women with the flexibility to do so are not actually CHOOSING to stay home with their children? You say it's because they marry "men who then allow them to deprioritize their careers." But couldn't it be equally true that these women marry men who allow them to prioritize their children? I'll agree that choice contributes to income inequality, which is it's own problem, but why assume women should always choose to work? Women who drop out of high school have lower rates of criminal convictions than men who do so, which certainly affects employability as well. This graph seems to contradict an earlier graph you posted on December 5th, 2010: "Education and Women’s Share of their Household’s Income". How do we explain this? "Second, notice that the most equal incomes (where women make 85% of men’s salaries) occurs among the youngest and least educated group: 25-34 year old high school drop outs. Why would younger women do better relative to men than older women? Some of this may be due to a decrease in gender-based discrimination. But it also likely has something to do with the devaluation and disappearance of traditionally working-class men’s work"
I don't know that most traditionally men's working class work is that readily available to the group with the least education....factory work is certainly disappearing, but that was never men's-only (or even necessarily male-dominated). Aside from that, most "working class" jobs I can think of, while they might not literally require a high school or associates degree, but the do require a certain amount of skill and education, and if just as many people who've graduated high school or had a year at community college are applying for those blue-collar jobs, they're going to likely pick someone with a higher level of education even if 12th grade English isn't REALLY necessary for their job. 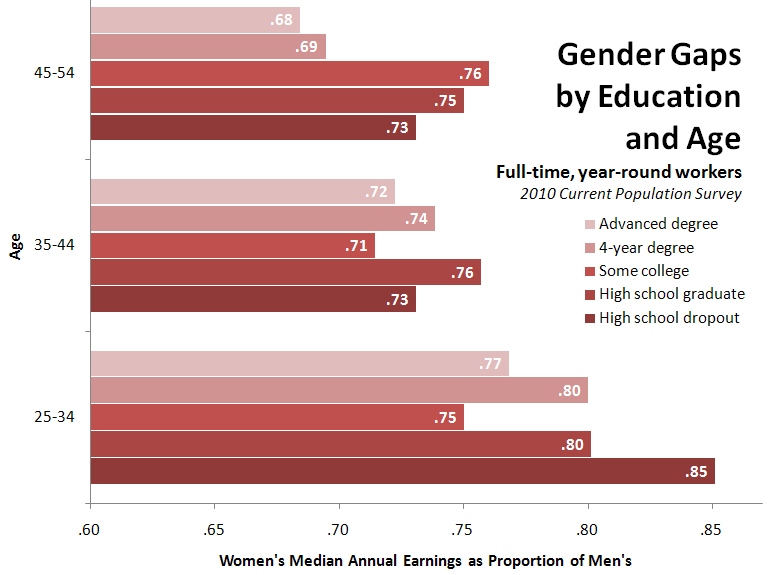 All I can tell from looking at this data is that women at a certain age and educational attainment make less than men. The data doesn't control for any of the countless confounding variables which could explain the disparity better than the implicit and trite complaint of gender discrimination. There's really very little to be learned from this data unless you're trying to justify a preconceived pet idea. One thing I think that you are overlooking is that the higher you move up the pay ladder, the more subjective your earnings tend to be. Lower-income workers often hold positions with a standard pay rate; you make minimum wage when you're hired, get a $.25 raise after a set period of time--things like that. There's very little room for gender bias to enter it. At least not until there's a question of who to promote to management, anyway. This is very different than negotiating a salary, where the employer has a lot of leeway to decide how much to pay a person. Not all married women are married to men. Many comments seem to assume that higher income women are less likely to work then low income/less educated women (and that these interrupted careers must explain the greater wage gap). However, as far as I understand the literature on this, the reverse is true: lower class women are less likely to work than are more privileged women. Can someone who works in this area clarify this? I didn't read all of the comments, but am I the only one noticed that this "study" groups all forms of education into one bar? In other words, it says that english lit is in the same category as being a surgeon? Or that studying general psychology has the same value as advanced engineering? Because that's what that graphs says, it says "educated" - but it doesn't split it by fields. Sorry, by "educated" I meant "advanced degree". What's worth more? Three masters in english lit, or one in surgery?